Everything you’ve heard about the Thai islands… it’s all true. It is literally paradise. The degree of paradise you find yourself in depends on a few key things: the company you keep, the time of year (rainy season runs from May/June to October), the kind of thing you’re idea of paradise offers you, the amount of money you have to spend too…. For example, if you adore scuba diving, then Koh Tao has plenty of diving centres that can offer all sorts of trips. For buckets of cocktails and the infamous Full Moon beach parties (check the date before you book! ), Koh Phangan is the island. For those with a healthy bank balance looking for a bit more tranquillity, Koh Samui is for you. For a more chilled out atmosphere relatively near to the capital Bangkok, Koh Chang (Elephant Island) strikes the right note. 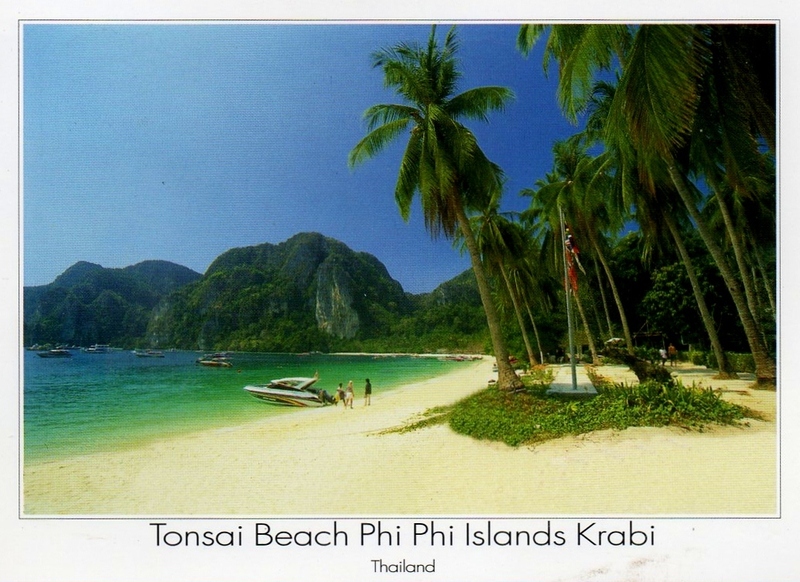 The postcard above is from Koh Phi Phi, where the film ‘The Beach‘ with Leonardo di Caprio was shot. That film is part of the reason why gap year backpackers have flocked from all four corners of the earth to the Thai islands and you will inevitably find a lot of them on most islands you visit. But that’s part of what makes them such an unmissable destination. Of course there are many places where you want to avoid other tourists at all costs, and yes, lying on a beach for days on each in isolation may suit some people, but many people will eventually grow tired of the peaceful solitude and will want to party and revel in their stunning surroundings. You cannot fail to fall in love with the Thai islands. I advise you to visit as many as possible and when planning your trip, allow plenty of time for seeing the islands as you will inevitably want to stay longer…. Don’t say you weren’t warned!